Hi, my name is Kim and I’m addicted to felt! 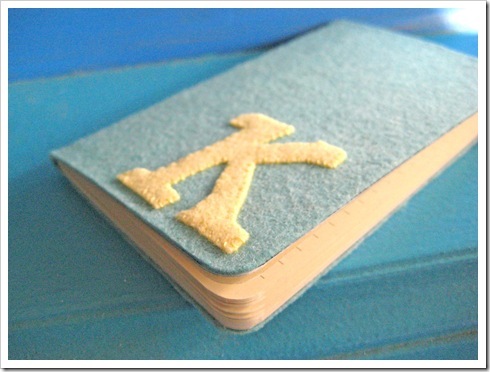 Yes, I’ll add a little felt to just about anything, and today I’m sharing how I made these sweet little felt initial notebooks. Use pretty Spring colors to create an Easter gift that perfect for any age! This is a fun project to do with a group of children or adults with just a few supplies. 1. Trace around your notebook on a piece of paper, cut it out and use it for your template. I bought a package of 3 mini notebooks on a clearance pile for less than a dollar. 2. For the initial I found a font that I liked online and printed out the letter. Then I used the copier to enlarge it to the right size. You could easily size it before printing if you prefer. 3. 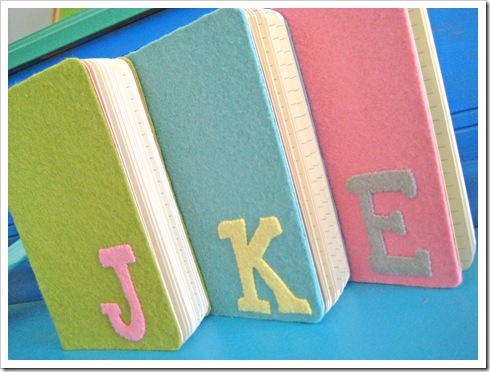 Pin the notebook template and the initial to the wool felt and cut them out carefully. 4. 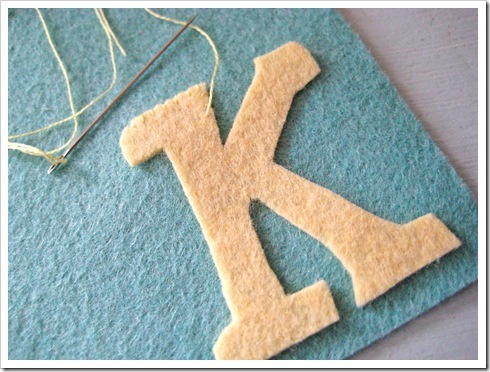 Line up your initial in the bottom corner of your template and attach it with two strands of matching embroidery floss and the stitch of your choice. 5. 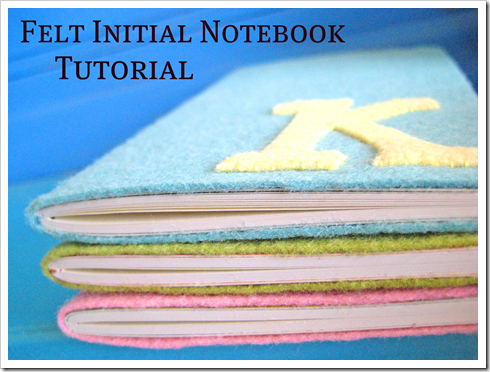 Once you have completely attached the initial it’s time to glue your cover to your notebook. I used a glue stick that came with my Smash Book but I’m sure most scrapbooking glue sticks will work. I did test it first on an old notebook with a scrap of felt and it really stayed put! Start at the front edge of the notebook and line up your cover. Be sure to lightly glue the whole edge and attach with pressure. Slowly add more glue and work your way all the way to the back of the notebook. It will stretch slightly as you go but don’t worry. 6. 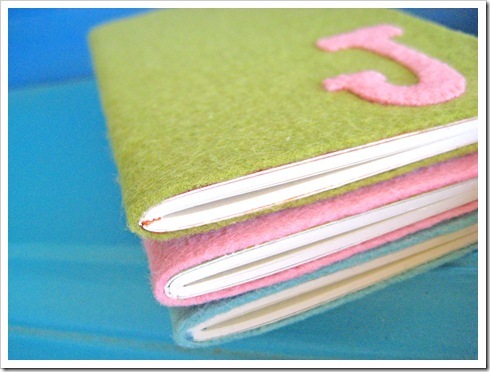 Once you are finished with the glue just trim around the whole notebook. Then trim again to straighten the few uneven spots you’ll have left. Sharp scissors make it easier! Simple and Sweet! These little notebooks are going to be gifts for some friends in Japan…handmade gifts rule, right? 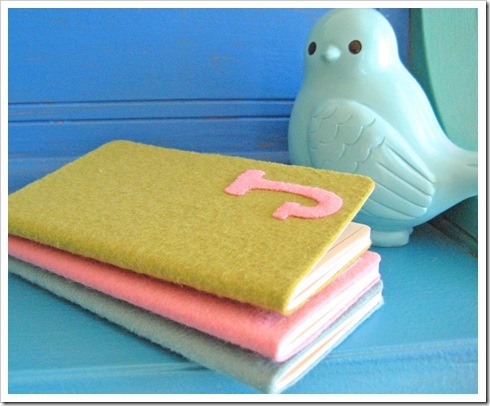 I hope you will try some of these quick felt notebooks for yourself! Please email me if you have any questions and I hope you’ll check out my selection of beautiful wool felt at KimberlyLayton.com for your next project! 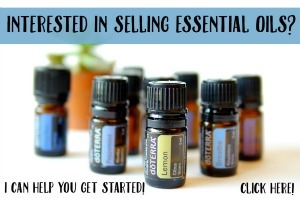 Need more Easter gift ideas??? Check out this post of 101 Handmade Easter Craft Ideas!!!! I really love these! I was actually thinking of adding notebook covers to my Etsy shop. I would use fabric, but the felt is too cute. You read my mind! These are so cute. 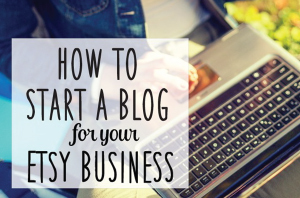 I also love that is is easy. I am looking for simple sewing and crafts to do with my 9 year old who just learned to sew. if you will trace your initial onto freezer paper so that it is going the right direction on the dull side. then cut it out around the initial leavin a small bit of space around the tracing. iron that onto your felt shiny side down. it doesn’t take very long. use the wool setting, you don’t want to scorch your felt! now cut out your initial. your scissors have something to get a true grip on and your pattern won’t move. 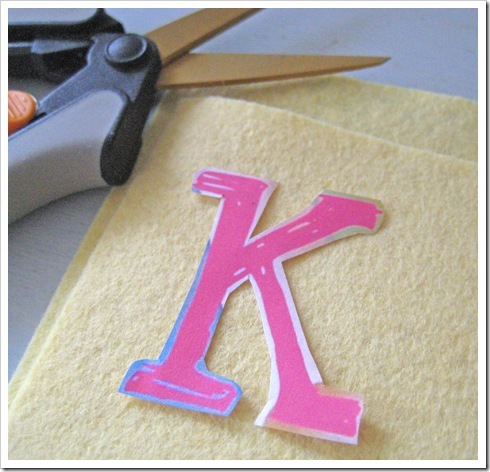 when you are done peel off the freezer paper and behold your crisply cut initial. Very creative……they look great, I might try it myself thanks for sharing it. Can you “teach” me the stitch you used? Or send me to a site to learn. I have always wanted to do that kind, but not sure how. I LOVE these journals!!! I am a college student who did this for a few three- ring binders. They worked out beautifully! One of the binders I put the subject rather than just my initial- so cute! Super cute idea! I featured this on my blog this week, it’s such a great homemade gift! Hey! I was not bothered about gifts for Diwali festival. I needed a quick & easy gift. So I’ll quickly make these! Hi, Love these out of felt. I’ve made several with fabric and craft paper–they are addicting!! Love these. I have been looking for a cute favor for a cross stitch retreat and this is it!